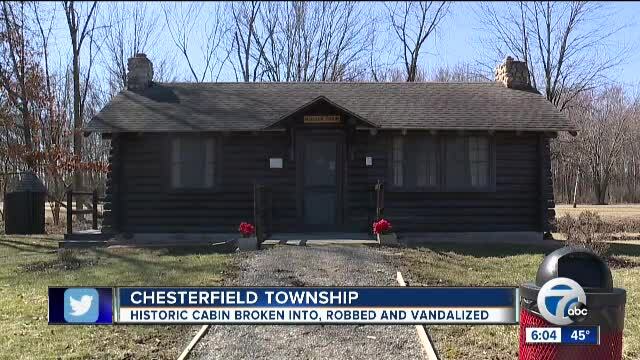 CHESTERFIELD TOWNSHIP, Mich. (WXYZ) — A historic log cabin was vandalized and robbed in Chesterfield Township, police say. The incident reportedly occurred between Dec. 7, 2018 and March 17, 2019 at a cabin located at 47275 Sugarbush, north of the Chesterfield Township offices. The suspect or suspects vandalized the log cabin and stole several items, including a replica .45-caliber Hawkins Rifle and antique violin. Anyone with additional information is asked to contact Chesterfield Township police at 586-949-4625.